You don't often get to break the news on genuine lost classic attractions. Although unbuilt concepts are still a matter of particular interest for certain Disney fans, the deeper you dig, the more often it seems that there was less there than meets the eye, or that the information usually presented about these things online is less than accurate. If this information has been circulating unchecked for many years, more often than not that information is more fiction than fact, which is one reason I spent so much space clearing up misconceptions in my piece on Western River Expedition. But what if there were a lost attraction that was not only compelling, but conceptually fairly complete and mostly unknown? Wouldn't that be really worth the effort to dig into, the make its secrets public? About five years ago, I first began to hear about a Marc Davis walk-through attraction intended for Fort Wilderness called Adventure House. I began to gather information and what loose scraps of art I could track, not certain if I would ever be able to share anything about this attraction, until last year I was finally able to obtain at auction what turned out to be an early outline draft of the project. From there, pieces began to fall into place and the forgotten story of Adventure House could now be told. In the years since, a few pieces of information have become available through the various fan events and Disney history sources, but I don't believe that anybody has yet done justice to this fascinating design concept. So, after much research and patience, I'm proud to present a look at one of the most singular efforts of one of Disney's best and brightest. It's time to welcome Adventure House into the fold. The year was 1976, and Fort Wilderness at Walt Disney World was riding high. The Bicentennial years of 1975 and 1976 had been red letter years for Disney following the tourism downturn spurred by the 1973 oil crisis. The hotels were full, the parks were busy - it was those years that allowed Disney to move forward on Epcot. 1974 at Fort Wilderness had seen the debut of Pioneer Hall and the wildly successful Hoop De Doo Revue. The Fort Wilderness Railroad had been up and running for a few years, and the crown jewel of Fort Wilderness had debuted in 1975 - River Country, an innovative and richly themed water playground for its day. In other words, as much as the Contemporary and the Polynesian, Fort Wilderness was growing into its own unique destination, with its own set of recreations and attractions for vacationers. 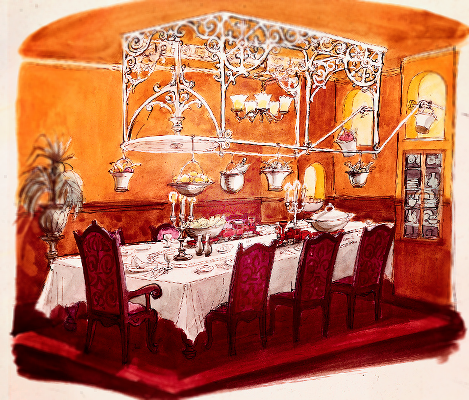 While side wheel steamboats brought boat loads of visitors to Treasure Island across the way, plans at WED were stirring to add even more unique offerings to Fort Wilderness to eat 70s guest time and dollars. "Early in 1973, a narrow-gauge steam railroad with Victorian-style open air cars will begin transporting guests along a three mile loop of track between their campsites and the campground's reception, recreation and entertainment areas. By next summer, the steam train will also connect with the new Fort Wilderness Stockade and Western Town where complete, dining, shopping, and entertainment facilities are being built in phases." "118 additional campsites will be constructed during the coming years which will bring the total available to 832 by June, 1976. That same month, a major extensive themed area for water recreation will open at Fort Wilderness. This will enable the company to establish a new revenue center at Walt Disney World. A variety of new admission ticket is being developed, which should also stimulate additional use of the Fort Wilderness Steam Trains, Treasure Island, and the other recreational facilities at Fort Wilderness. These will be available not only to guests of the campgrounds, but to hotel guests and others from all over Central Florida." "Already the company's 'Imagineers' are at work designing new attractions for River Country, possibly to include more water slides, an additional raft ride or a two-man boat ride. Ft Wilderness itself is slated for further expansion in the near future. Plans call for a Frontiertown, a new recreational complex and still more campsites." It's not tough to read between the lines and conclude that WDP saw the possibility to add an extra day to the vacations of visitors, a major concern through the 70s and 80s and something that the Lake Buena Vista complex was only halfway successful at doing. They were looking for ideas, and at some point, Marc Davis began suggesting them. His idea was to build a fun house. The initial proposal was for a massive red barn, which is easy to see sitting in well with the down-home atmosphere for Fort Wilderness. The caption of the art is "A kind of indoor 'Tom Sawyer Island'", which is as fair a pitch as I've seen. By 1976, the red barn was gone, and the concept for what would soon become known as Adventure House would be much more developed. 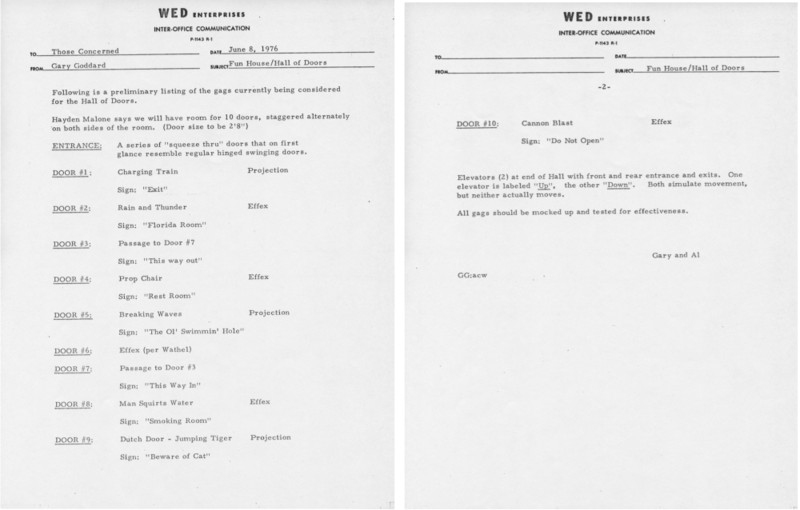 Assisting the core team of Marc Davis, Al Bertino and Wathel Rogers was WED newcomer Gary Goddard, who typed the June 1976 memos which outline the status of the project. It is through these memos that we have insight into the initial ideas for Adventure House. Characters: Our hosts are the original builders of the hotel, Jasper and Maude. Jasper is meek and mild mannered and a "tinkerer" who has created many of his own "inventions" and additions to the hotel, including the whirligigs that abound on the roof of the building. Maude is a heavy-set, strong lady who likes her pet chickens very much, and is a hero-worshiper who has named many hotel rooms after her idols. Themeing Overall: The entire hotel is filled with Maude's chickens who rooster wherever they feel like it. These chickens cluck, squawk, sing and talk - depending on their mood. All over the hotel, these hens provide gags and comments on the various experiences. Theming - Individual Rooms: Each room has its own character in terms of the design and function within the hotel. In addition, a number of rooms are named after Maude's famous guests, Paul Bunyan, Ichabod Crane, Johnny Appleseed, etc. The overall feeling of the hotel is that there was a genuine attempt at creating the best hotel ever - but that in the building of it, things were not completed to exacting specifications. If it looked good to Jasper and Maude, they nailed it down and painted it. We're in Marc Davis territory here for sure. 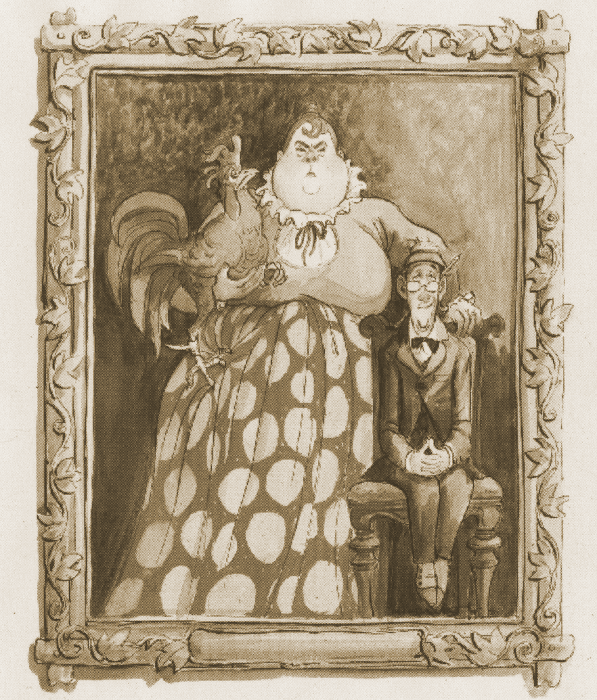 Jasper and Maude are nothing but the latest version of Marc's beloved henpecked husband jokes that were the basis for so much of The Haunted Mansion, except in this case with a twist on the story of Jack Spratt. And yet other details here are suggestive as well - the eccentric architecture, for one. It's easy to imagine a high victorian interior somewhere between Grizzly Hall and The Haunted Mansion, with the eccentricity of a low budget Winchester Mansion. 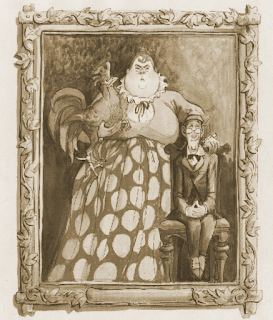 The chickens, too, bring to mind the aborted idea to have a raven narrate the Haunted Mansion. But just as worth noting here is the preoccupation with American folk stories, which is as significant a signpost for late Marc Davis material as any. After America Sings, Marc went all in on Americana at WED, and the result was some of his most intriguing work. In the early planning for EPCOT, he had created a concept for an attraction at the United States pavilion, based on characters such as John Henry, Ichabod Crane, and Captain Ahab. A later version of this attraction used noteworthy historical Americans, and under a different team would mutate into The American Adventure. And of course, we need look no further than Western River Expedition and the proposed "Land of Legends" at Disneyland for the connections to Adventure House to run deep. For more on both of those, see my article here. Maude: You might be wondering' 'bout all these here chickens.. well, when we first moved out here, all them wilderness varmints outside wanted to sink their teeth in our hens ... so we just moved 'em inside to be safe and they been here ever since ... I even lost count count of all them cluckers... but anyway, that's why we call this place 'The Hotel Roost'. Maude: Tiger here is my pet and he's the great, great Grandfather of the whole flock... Say 'Hello' to the people, Tiger! Jasper: Did you call, dear? 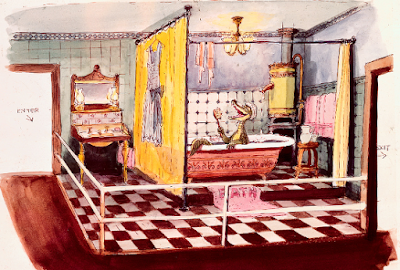 Maude's Kitchen, where hens lay eggs into Jasper's "egg mover" and appear to roll uphill, another gag where water runs uphill, and two chairs that are actually boxes and thus are impossible to get out of. 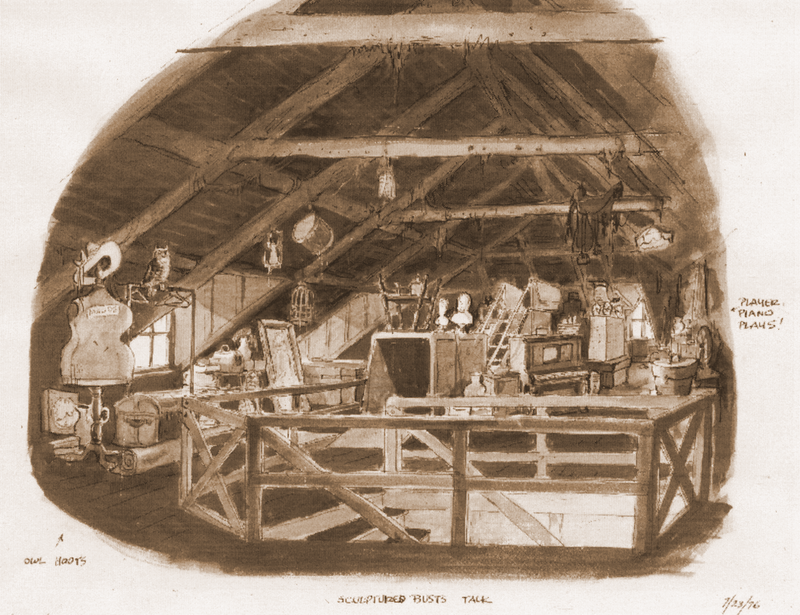 This strongly suggests that Marc was very familiar with the Haunted Shack at Knott's, and is also confirmation that he had a hand in the design of the Mystery Mine on Tom Sawyer Island. The Barrel Room, with barrel tops spinning on the floor and teetering barrels on the walls. 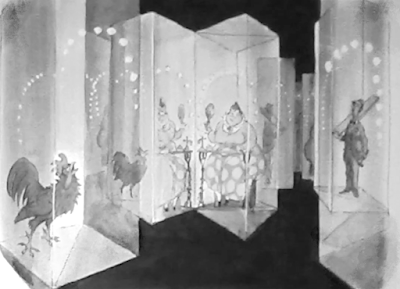 The central area includes a large spinning floor with a stack of barrels topped by a drunken chicken who sings. Various barrels have sound effects from inside them such of gurgling or hiccups. Paul Bunyan's Bedroom, a tall room where the entire floor is a "quilt" - and a huge bounce mattress. On the wall are three huge paintings of Paul, Babe the Blue Ox, and his axe. 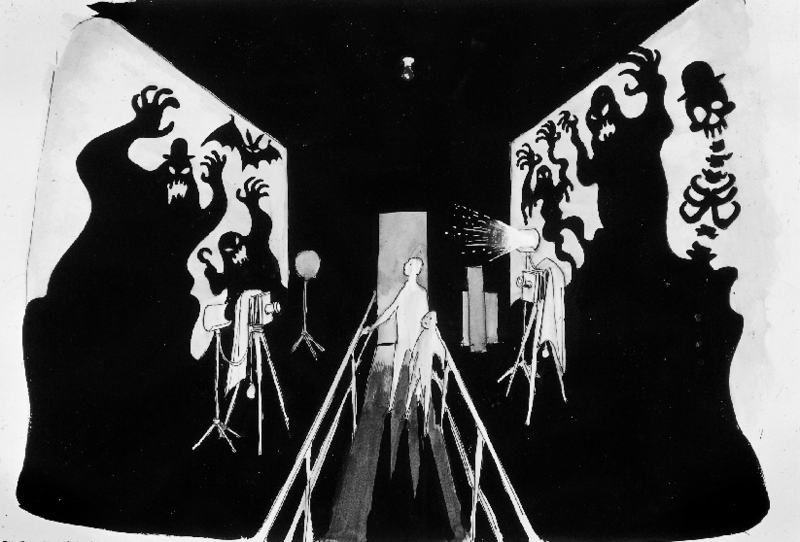 The Hall of Doors was to be the main showcase of Wathel Rogers' projection screen technology, where various doors would open onto gags, such as a door marked "Exit" that would appear to open onto an oncoming train, or Rain and Thunder behind a door marked "Florida Room". Another door marked "Rest Room" would open onto a single chair, and one labeled "No Smoking" would have the figure of a man who sprays water at the viewer - presumably, behind a glass panel. At the end of the hall were to be two elevators that would appear to take viewers up or down but actually go nowhere. Windwagon Smith's Nautical Quarter, a circular room with windows looking out onto Frontier Town, with various cranks and levers that would spin and rotate the weather vanes on the exterior of the house. Other rooms were already running into issues or seemed to be conceptual dead ends. A mirror maze was to have two dead-end areas where projections of fluttering bats and the headless horseman throwing his pumpkin were to be triggered, and another, the Dark Maze, to be experienced entirely through touch, is exactly the sort of thing that theme parks can't do. 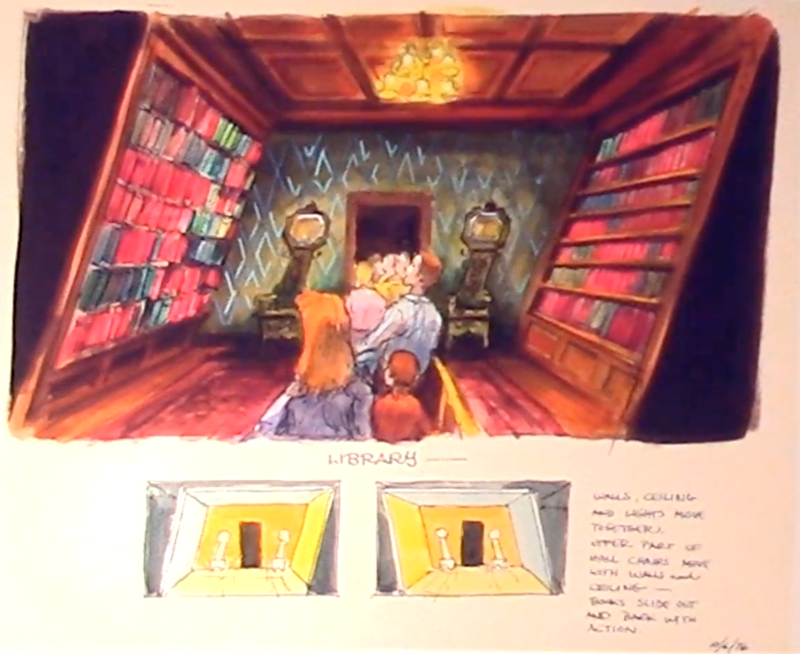 Memos also indicate that in mock-ups they were having trouble with the first illusion room, the Perspective Hallway. There's no real hint as to what it's intended to be, but my guess is it's some kind of spin on the "diminishing mine shaft" on Tom Sawyer Island. In any case, it seems clear that these and other concerns caused Marc and Al to do a radical re-think of the concept for The Roost, which led to some of Marc's finest and craziest ideas for WED. The largest distinction between the Adventure House and Roost version of the attractions comes down largely to interactivity. A lot of The Roost was the kind of classic fun house attraction that was already dying out, with shaking stairs, rocker panel floors, and crazy mirrors. Marc's final concepts seem to ditch the hotel theme and double down on the weirdness - gags and illusions in the style of the Haunted Mansion. This was a long time coming and a return to form for Marc. 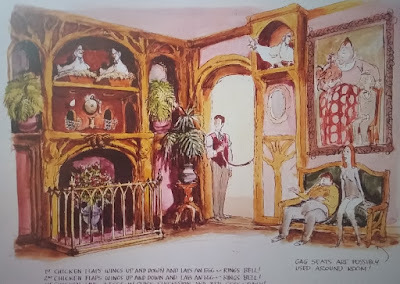 He had always kept a torch burning for the walk-through version of the Haunted Mansion, having been sufficiently impressed by Rolly Crump and Yale Gracey's ghostly sea captain vignette to find ways to insert the character into the final attraction. 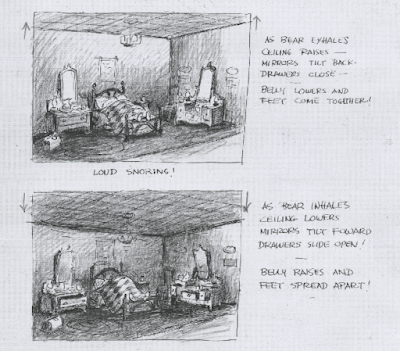 Marc even wrote several drafts of a walk-through version of the Haunted Mansion, the version where "The most dangerous ghost in the Mansion" turns out to be the host. Later, Marc developed a huge number of gags for Tom Sawyer Island at Magic Kingdom, most of which were very interactive in nature - slides, trees to climb, etc. His influence in the final product is most keenly felt in Injun Joe's Cave and the Mystery Mine, although I've never been able to determine if he actually oversaw these. So Adventure House is a fascinating look into ideas that one of WED's best designers had been ruminating on for years. Let's go inside, shall we? The waiting area carries over Marc's roosting hens, this time as a sort of time piece - each time a hen lays an egg, it drops into a basket and the bell rings. When one of them plays three eggs, the bell begins ringing rapidly and the portrait of Maude and Jasper comes to life for the pre-show! Note the benches here that expand or sink - another one of Marc's clever re-utilizations of an existing WED effect, in this case the inflating seats from Flight to the Moon. 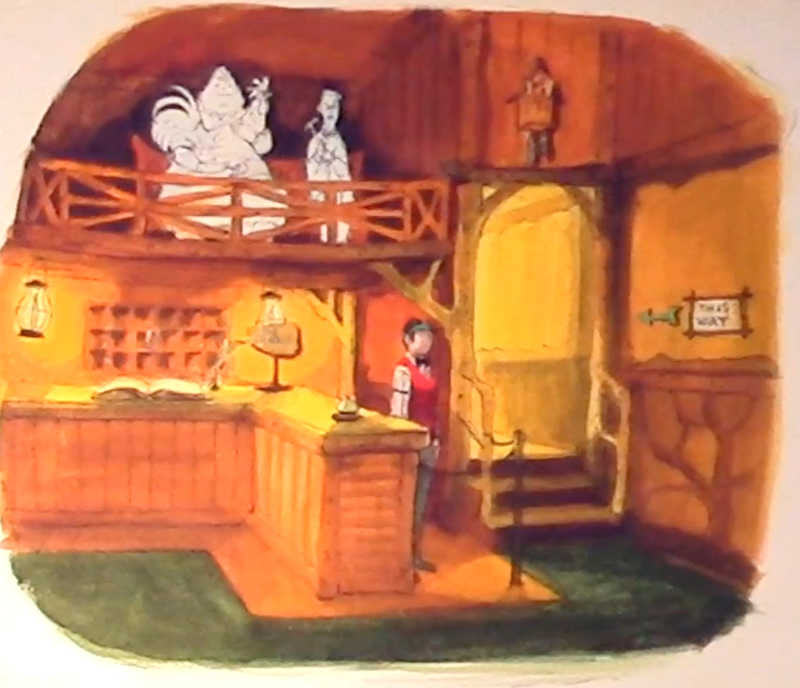 It's also a premonition of the Adventurer's Club, of course. After the pre-show, groups are admitted to the Library, where presumably a Cast Member will give a short safety spiel, before releasing them into the attraction through a door at the back of the room. Notice that the "perspective hallway" has been abandoned, and that the "prairie schooner hall" is now the introductory effect of the attraction, viewed from the stationary hallway outside. Unlike at the Haunted Mansion, this hallway is truly endless! Between each major scene, Marc designed short hallways to link the experiences, some of them fairly simple, others truly strange and baroque. He specified that each hall be treated with sound-proofing material, to give the effect of going from very loud gag rooms to dead silent hallways. 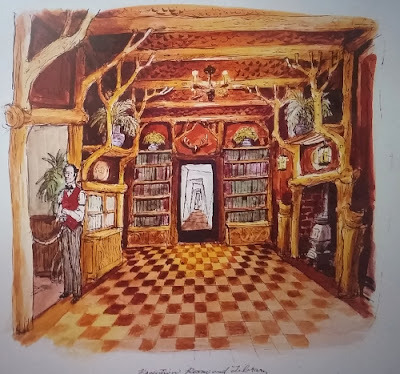 It seems likely that as guests wind through Adventure House, the linking hallways would become increasingly abstract, until the walls and floor were painted in Escher-like patterns in eye-popping red and black. The room sequence here is nothing but a good guess, by the way. 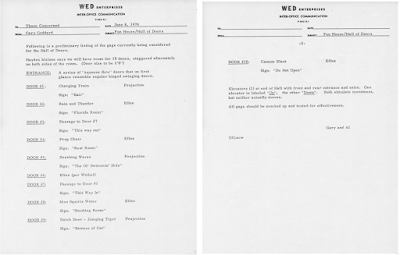 If a document exists specifying order and layout for this version of the show, it has not yet surfaced. The first scene seems to still be the Dining Room, but instead of a tilt room it's now a visual gag where an overhead bucket system carries food above the dining room table while model trains on the table top carry platters of food in and out of the kitchen. This was to followed up by a Kitchen scene where the buckets appear to glide out of an old-fashioned larder cabinet, heading out to the Dining Room full of food and returning empty! Nearby, a water pump pumps water by itself and kettles rattled on the stove - effects recycled from the Carousel of Progress, and which Marc first attempted to re-use in the Haunted Mansion. Marc specified that the model trains should make the same sound as full-sized locomotives, by the way! 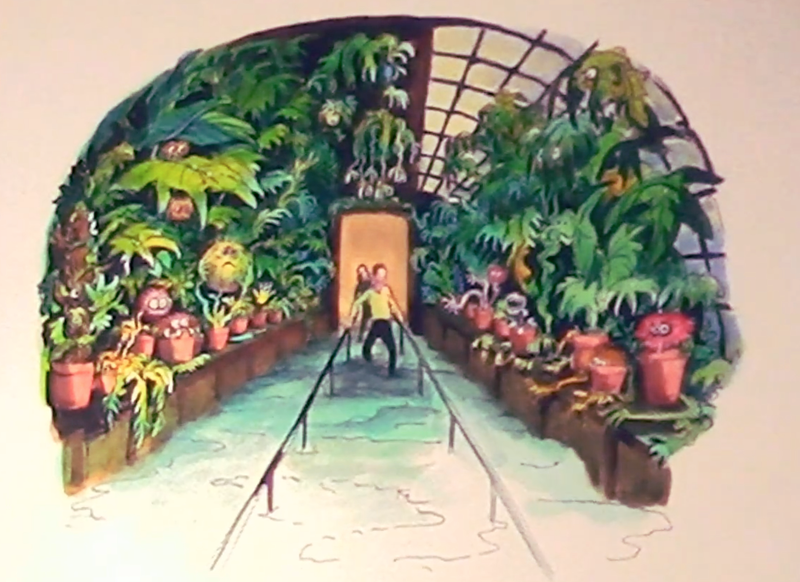 Next, guests would descend into the greenhouse, full of goofy and leering "man-eating plants". The floor here was intended to be a soft material, and covered by a low layer of fog! Again, the links both to the Tiki Rom, Haunted Mansion, and Jungle Cruise are unmistakeable - Marc even designed a belching man-eating plant for the Florida Jungle Cruise that didn't make the final cut. Upstairs now to Jasper's Den, the new tilt room illusion. The centerpiece of the room is now a billiards table where the balls appear to roll uphill. 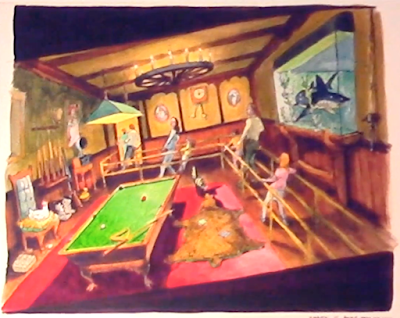 Note the fish tank with a full-size shark swimming inside - not only a vestige of Wathel Rogers' projection scenes which once were a key part of The Roost, but a good example of Marc's problem solving ability. No doubt through testing and application of the screens in attractions like If You Had Wings, Marc was keen to find a way to make the technology appear more "real". Placing the screen behind an aquarium filled with seaweed and bubbles would diffuse the image just enough to turn it from yet another obvious screen into a real illusion. The other gags in here are decent, such as the cat terrified of the bear rug. The cat is direct from Pirates of the Caribbean, and another example of cost-saving measures designed into the attraction. The clock pendulum is supposed to animate at an angle that implies the room is tilting the opposite direction of the way it is, which is a nice touch. More total weirdness, the Photography Studio has cameras set up on each side of room, alternately flashing. Each time they flash, the "shadows" of various ghouls illuminate the walls, slowly fading out. This was likely intended to be a simple effect achieved with slides or cutouts mounted behind scrim walls on the left and right - dead simple, but very interesting. Here's two of my favorite Marc gags of all time. Not everything the man came up with was a winner, but if anybody ever claims he wasn't as sharp at the end of his career at WED as he was at the start, you have my permission to wave these under their noses. Let's take a peek inside the Guest Room at Adventure House. Guests entering immediately hear loud snoring and spot a huge shape asleep under the covers - it's a bear! His huge expanding belly and paws can be seen, moving in time with the snoring. The sound is so severe that every time he inhales, the room's ceiling pulls down, and every time he exhales, it shoots up away from the floor! A nearby chest of drawers opens and closes in time with the snoring, as well as a swivel mirror that is pulled towards and away from the bed. A cross-stitch sampler above the bed reads "MANY BRAVE SOULS ARE ASLEEP IN THE DEEP". Did you see it? Did you make the connection? It's the Stretch Room. One thing that impresses me so much about this gag is the the Stretch Room is one of those things that's so iconic, so memorable, that nearly everybody who attempts to do a spin on the illusion just ends up repeating it. You can spot a stretch room knockoff immediately. But here's a spin on the basic illusion that has nothing to do with changing portraits or vanishing ceilings. Marc is, as far as I know, the only person to ever come up with a viable alternative on the illusion that actually brings something new to the table. Oh, and it's really funny to boot. Again, the staging here is simply superb. Marc had really been digging into how to direct guests through theme park spaces throughout the 70s, and his use of a Claude Coats-style "reveal space" here is extremely effective. Budding and current theme park designers take note: this is the way you set up and pay off a joke. Here's an odd concept for a library with tilting walls; as the walls tilt forward, books slide out of the shelves and stop, then slide back in as the wall tilts away. Not nearly as effective as the "Prairie Schooner Hall" and Guest Bedroom gags, but still interesting. "The effect of the room is to be a feeling of crawling in, around, over and through various articles of furniture, props and assorted units. The room should be designed with primarily younger ages in mind, but structurally it should support the weight of whoever might want to make their way thru it. [...] Basic experience is to enter the "obstacle course" by entering the open front of a trunk and then proceeding through a multilevel series of tunnels, bridges and platforms [...] Last effect is a short, straight slide into a pile of plastic eggs (chickens are above, squawking)." Yes, it's a kid's playground. You can see the trunk entrance to the left and the adult walkway off to the right. Presumably all of the other various illusions would be present to keep the adults amused. Next time Disney opens a pedestrian play area in one of their parks, remember that Adventure House found a way to make it unique. It's hard to know exactly why projects never get off the ground at Disney, even less so back in the 70s when all we have left is art. Adventure House seems to at least had the support of some in WED, enough for Marc and Al Bertino to be mocking up sets and mazes and running tests on effects, which is nearer to actual realization than something like, say the Snow Palace came. It's easy to see what the thinking was. A trip to Discovery Island, River Country, and a lap through Adventure House and dinner at the Hoop-De-Doo is a full day for anyone, and the notion of there being an actual Disney-style full attraction to take in may have just been the thing to start diverting traffic in that direction that turned the combination River Country / Island ticket into an actual full day draw. 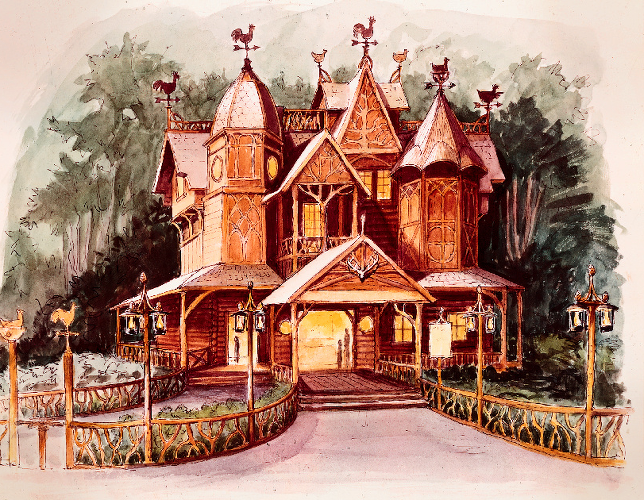 Personally, I think something like Adventure House still has a place at Walt Disney World. Any modern version would need to have a wheelchair route that goes around the most significant obstacles, but that seems to have been the plan anyway - early memos mention a "chicken route", marked with statues of pointing chickens, for those who preferred to watch but not interact. In almost every other way the idea makes sense: the illusions are low-maintainence, and there's no ride vehicles to break down. I could see this attraction doing very well at Disney Springs, where some families seem to be at a loss for things to do. If it cost, say, $5 a person to go into Adventure House, it could be a low operational cost, high-profit attraction. As for Marc, Adventure House was near the end of his career for WED before his retirement in 1978. Towards the end of his career, Marc's ability to get new projects off the ground was dramatically compromised, which must have been a frustration for a gifted designer who once had Walt Disney's ear. Although brought back after retirement to help design Tokyo Disneyland, his last significant new project for Disney was The World of Motion, which was publicly credited only to Ward Kimball until fairly recently. And just like that, the man who put more "Disney" into Disney than probably anyone other than Walt Disney was gone. When you consider exactly how much the humor and characters Marc worked on still defines what Disney is - from Thumper to Cinderella to Tinker Bell and Maleficent onto the Jungle Cruise, Tiki Room, Small World, Pirates of the Caribbean and the Haunted Mansion, his influence is still huge and unavoidable. Since I first found out about Adventure House I've been working diligently to make this material as public as possible. I would not have been able to succeed without the help of those in "The Chummery", Mike Lee, J.M. Jr., "OrangeBird517", "WDWSkip01", and more. Thank you everyone! Ready for more WDW History? Check out our hub page, covering all sorts of forgotten Walt Disney World obscurities. 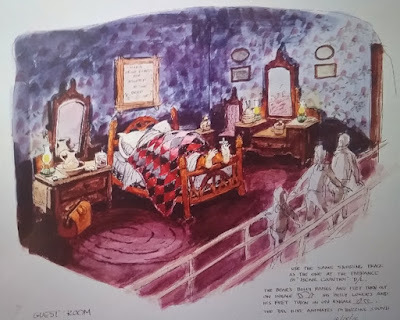 For more Marc Davis check out our individual hub pages on The Haunted Mansion, Pirates of the Caribbean, and the Jungle Cruise. Happy adventuring!